Although announced quite some time ago, the WiThings Activite smart watch has started shipping, and planning hit doorsteps early in the new year. The Activite watch tracks steps and sleep patterns whilst wirelessly shares the data to a smartphone, the difference you ask from all the others out there. Well, the Activite looks like a precision engineered Swiss Timepiece and there’s good reason for that, it is one! Running off of a normal watch battery it looks like weekly charing is also a things of the past. Designed in Locle, within the Swiss watchmakers valley, the dials come in 2 colors: a sleek black pattern with an orange accent and a glistening white face with a blue accent. Both dials feature a pair of glittering hands. Protected by a scratch-proof domed sapphire glass, the 5 ATM water-resistant case is made from a stainless 316L alloy steel resilient to time and corrosion. Another stand-out feature of the Activite is that it can record swim activity which is something sorely lacking in many other activity trackers and smart watches. Due to this, the watch ships with a silicone watch strap for swimming and is 50m water resistant. Click here to find out more on the WiThings Activite – be warned it has a hefty price tag, but damn would I love to get my hands on one! 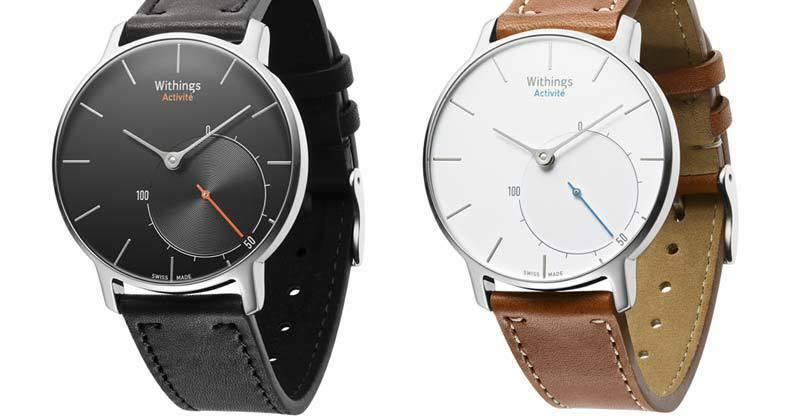 Withings Activité Smart Watch : Best Smart Watches 0 out of 5 based on 0 ratings. 0 user reviews.